I know a woman who works in the White House, and she said that Michelle Obama didn’t want to build raised beds for her garden because it sounded too hard for people. I agree it can sound intimidating. However, so is standing before a patch of grass grown in concrete-like dirt that needs to be turned into a garden. Raised beds are actually the easiest way to get started with a garden, since you just start right on top of the grass and bring in fresh soil and compost (so you don’t have to worry about your old soil being too contaminated—although it’s always a smart thing to get your soil tested before planting). The best source for tools for raised beds is Gardener’s Supply Company, a fantastically, devotedly organic catalog that has been around for as long as I can remember. They offer kits of all sorts, from corners for putting your own wood together to recycled-plastic beds that look like wood, or my new favorite, galvanized-steel sheet metal! For all price ranges and styles, you can’t beat Gardener’s Supply as a source for raised-bed gardening. Once you get the sides, you can do it the lazy, easy way or the meticulous, hard way—depending on your desired outcome and personality type. Lazy way: Stick the sides in place, cover the grass with layers of cardboard, newspaper, leaves, or straw, and then pile on the compost and topsoil. Then plant! The hard(er) way: Dig up the grass and loosen the soil underneath—either by hand or with a rototiller—stick the sides in place, and then pile on the compost and topsoil. See, that’s not so hard either! 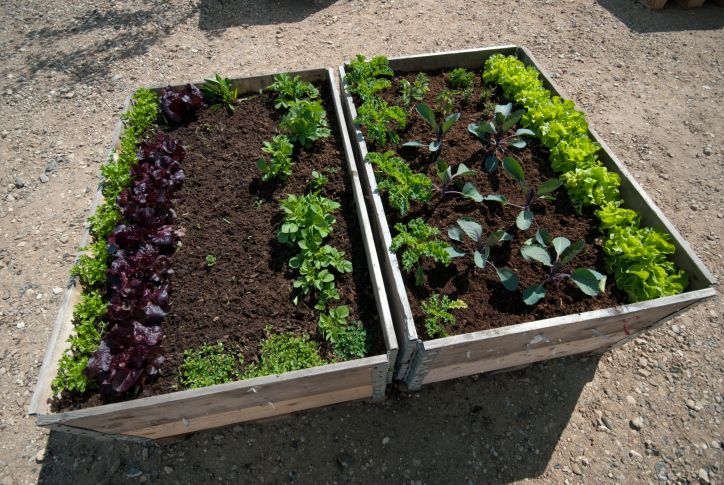 Remember, the quality of the soil you put into your raised bed is what will make your gardening successful. Where to get good soil will depend on your location and region. In my area, I love Hawk Valley’s mushroom soil mix. It’s light and fluffy, and so rich in nutrients! Pioneer Woman’s blog also has a good how-to for building and using raised beds. I added one last year and hope to add another one this year. Amazing blog post! Thank you so much for sharing! I love the lazy way! I’m doin’ today! Thank you for validating my vision for my raised garden! I’m not opposed to building raised beds – but don’t you spend a lot of money on soil? And how do you verify the “integrity” of the soil you buy (chemicals, etc)? Im 84 years old and its hard for me to get down,so I built A 4 by 8′ box 8″ deep from hemlock.. Put it on legs so it is waist high. Lined it eith plastic with drainage slits in the bottom. Filled it with peat moss vermiculite,copost wood ashes ,bone meal. Things grew great in it. I now have 6 boxes and 2, 4 by 4 boxes. I planted tomatoes,parsley,peppers,bush and pole beans , turnip,beats, carrets, chard,cabbage,broccoli, lettuce and raddishes. Tried two potatoe plants and got 10 medium size potatoes. Hey there! I am trying to get back to some gardening – I used to have a HUGE garden in our old house – before I had kids (all antique garden roses – lol – I wasn’t worried about food then) – and now I want to build a raised bed for tomatoes and some other veggies. I have been trying to decide how to get started – and your post just reminded me of lasagna gardening! Best raised bed I ever made – back when I was composting and growing roses – was built with Sunday edition Houston Chronicles (I had an unlimited supply of past issues) – I layered those on top of the grass – then filled that in with old cabbage from a friends garden – she had waaaaaay too many – so I dumped them all in the bed. Then, I threw in a whole bunch of coffee grounds I’d been saving – and then a top layer of leaf mold and then compost – it was the best bed ever – and I planted in it right away – I just shoved the cabbages out of the way and plopped the roses in. One year later – perfect bed – and the best roses! I need to implement this plan to get my new veggie garden growing! Oh hey – a friend and I just started a blog you might like “Becoming an Organic Family” – http://www.becominganorganicfamily.blogspot.com – and we put a link to your blog on it as well! Check it out!! Hey all! Lasagna Gardening is great (in fact we published the book many years ago). Some people worry about putting newspapers and their toxic inks into the soil. If you are worried about that, you can use cardboard (although it may be sprayed with insecticides if it came from overseas), or just other paper waste. Or you can just use lots of leaves and rotting veggies! Straw! Make your own veggie lasagna in your garden! Hubby and I went the lazy route last year when we built our raised veggie garden, and found that a bit of grass still came through – although we completely covered bottom with cardboard. We just pull the grass and weeds as they come up, no big deal. I need help/resouces for replacing raised beds. I want to know what kind of rot resistant wood or other material to use. Years ago, I used pine and also spruce. I think I would prefer wood, but is there a safe synthetic or plastic? I know treated wood is very bad. Please advise. Have enjoyed many years and would encourage others to try. I started with one 4x16x8″ and added another and another until 5 that rotate plus one for asparagus and one for strawberries – for reference help, I used Jeff Ball’s Self Sufficient Suburban Gardener and M Stouts ideas for double digging. 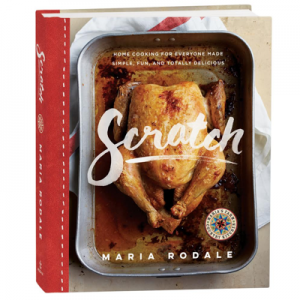 Also, the easy way or even harder way that Maria Rodale suggests sounds fine to me. I’ve been organic gardening since I was 5. 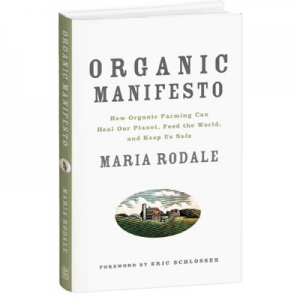 In the early ’80s I started reading all the Rodale info I could get my hands on. I’m now a gramma and my kids are into organic gardening too, reading the books and teaching the grandkids. It’s the ONLY way to live!! I’ve been getting Organic Gardening for a long time. I have a bunch back in the 60s,The were small back then. I’ve started my plants out in the shop under floresent lights. I hope I’m not jumping the gun to soon. I get get garden fever. I am ordering my 6′ or 7′ pvc vinyl privacy fence (with gate) to put up in the autumn so that I can get moving on my veggie garden next year. With all of the deer, groundhogs, squirrels, & rabbits, it is greatly needed. I have found a center very near to me that supposedly sells high quality enriched top soil, premium compost, organic spent mushroom soil and other soils which are steamed, screened and well rotted (at a premium price, I might add) so I think I’ll start with 2 or 3 raised beds and go from there every year. I can’t wait to get started. I have a lot of weeds to get rid of in the section that I want to plant, so I’ll clear the weeds that have come up already and keep black plastic on the area for the next few months to smother anything that may pop up until the fall. Looking forward to growing in raised beds again like I did in New York. I’m having a little problem. Even though I keep my floresent lights close to my tomato plants.They are a little leggy, and have a little problem with green Alge on the potting mix.Altho I have a fan cerculating the air. My pots ,3 1/2″ plastic ,in containers, Bottom watered. I planted potatoe in a box 4by4 -8″ deep.Filled with peat moss ,perlite,compost, and 5 4by4 boxes on the ground. I was short on compost so didn’t use any on the ground.Did mulch with grass clippings. When I dug them up the ground was hard like rock and potatoes miss shappened.The ones in the raised box were nice. All I had to do was reach in with my hands and pull them out. Being waist high I could see the weeds and kept them out. And to keep them mulched. Got a 5 gallen pail a little over a half full from the one box. This year I built 2 more boxes 4 by 4 and ready for next year.